Toyota's recent issues have turned the lights on automakers' and governments' responses to consumer complaints. Two of the questions to arise, which still haven't been answered, are what is the threshold for customer complaints to be considered a safety defect, and when should the National Highway Traffic Safety Administration open an investigation? An example? 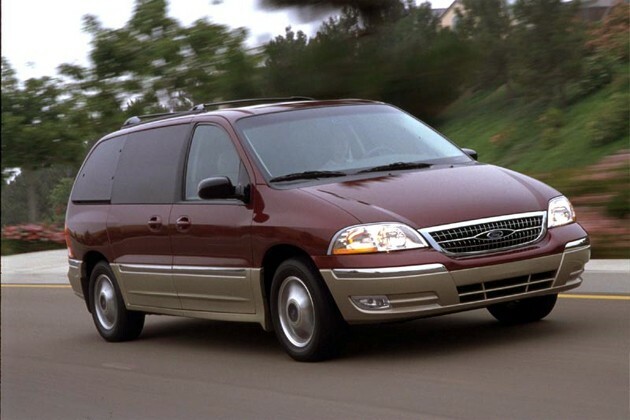 More than 200 owners of 1999 to 2003 Ford Windstar minivans have submitted complaints to the NHTSA about snapping rear axles, but there has been no investigation and Ford says there's no safety issue. The breaking-axle incidents have happened after 80,000 miles, the majority coming after the six-figure mileage mark. Ford's take is that nearly all drivers have retained control of the vehicles, and the few that haven't have described behavior that doesn't fit with Ford's predicted vehicle behavior in such an incident. Therefore, it isn't a problem with safety. As for the NHTSA, even though the complaints are spread over various categories (consumers choose their own categories under which to report), it says it has reviewed every single one of them and says it is monitoring the situation. We suppose everyone is relying on good judgment to decide when or if to declare this a safety matter and open an investigation, and we can agree with that - good judgment can make far more sense than trying to slap hard numbers on these kind of occurrences. The question is: Who's the one with the good judgment? Report: Hundreds of complaints about Ford Windstar axles snapping, yet no NHTSA inquiry originally appeared on Autoblog on Tue, 11 May 2010 10:29:00 EST. Please see our terms for use of feeds. Porsche plans to grow quite a bit between now and 2015, with a goal to hit 150,000 global sales. That's about twice the German sportscar maker's 2009 totals. That sounds like a very tall order to fill, but Detlev von Platen, CEO of Porsche Cars North America, reportedly told Automotive News that the task could be accomplished with the help of Volkswagen technology. Von Platen says that a decision on future technology synergies won't be made for another six months, and added that those decisions won't be announced until a much later date. Von Platen says, "It makes sense to think about some synergies in terms of research and development, and these discussions are taking place at the moment with VW." While we're sure that diehard Porsche fans will likely be less than pleased with the prospect of VW-infused Porsche products, the fact is that we've been living with just such an arrangement for some time. In fact, such such synergies have existed since the founding of the two companies, with the 914 (seen above) being the most well-known example of platform sharing. And, as you likely know, the Porsche Cayenne currently shares a basic platform with the more spartan Touareg, so the well-trodden path has already been laid for future sharing. Among the items that could be shared are fuel efficient powertrains and possibly even additional platforms. But a quick glance at VW's current stable of vehicles doesn't show too many (if any) platforms that would be suitable for Porschification. One vehicle that has been rumored at Porsche is a sub-Boxster ragtop that could help the automaker boost sales while also increasing the company's overall corporate fuel economy. A VW concept that could fit nicely is the adorable little BlueSport from the 2009 Detroit Auto Show. That concept, which VW says will hit 57 miles per gallon on the Euro driving cycle, even featured a mid-engine layout; a staple of the Boxster and Cayman. Volkswagen and Porsche may share more technology originally appeared on Autoblog on Tue, 11 May 2010 09:59:00 EST. Please see our terms for use of feeds. Will the Honda CR-Z really appeal to the tuning crowd? According to John Mendel, executive vice president for automobile sales at American Honda, people his age (55, for what it's worth) remember the seminal CRX as a highly tunable and fun-to-drive little hatchback that happened to get excellent fuel economy. Sure, we'll go along with that. Mendel continues, though, to suggest that the Japanese automaker expects its new CR-Z hybrid hatch to sell in large numbers to those older-generation tuners. Really? Sure, we suppose we can buy the argument that the tuning crowd will see the the car's hybrid system as more than just a means to boost fuel efficiency. After all, it does add about 20 horsepower to the car's final output. But bear in mind that the power figure we're talking about is still just 122 ponies and 128 lb-ft of torque. And that's not a lot of power to work with, though we'd imagine the six-speed manual gearbox will help extract those overworked horses. Now that it's a decade old, the original two-seat Honda Insight has indeed earned a bit of credibility from the tuner crowd... but most of its credentials come from all-out engine swaps that allow the car's light weight and aerodynamic prowess to truly shine. 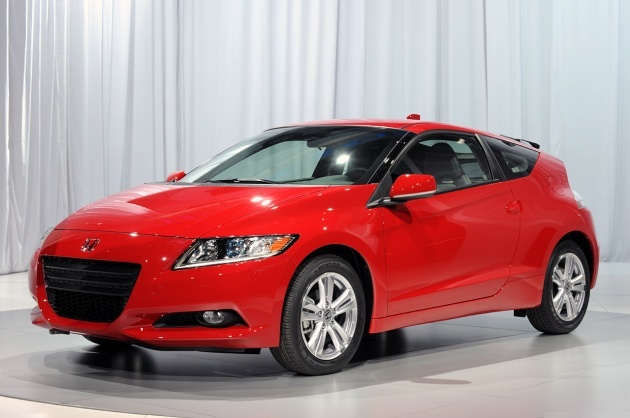 We can't imagine much of that going on with this brand-new CR-Z. But what do we know? Here's hoping that Honda's upcoming sporty hybrid hatchback beats all of our lofty expectations. Will the Honda CR-Z really appeal to the tuning crowd? originally appeared on Autoblog on Tue, 11 May 2010 09:29:00 EST. Please see our terms for use of feeds. Almost since the day that Mercedes-Benz introduced the A-Class and then B-Blass models over a decade ago, the company has been hemming and hawing about whether to offer the cars in the U.S. market. A combination of factors, including unfavorable exchange rates and limited American demand for hatchbacks, conspired to keep both models out of this market - although they have been available in Canada. With a new generation B-Blass set to debut in 2011, Mercedes-Benz has been taking another look at offering the car here and has been holding consumer clinics to determine whether to sell the car and with what body style. A crossover, sedan and a sporty coupe are being shown, but the hatchback apparently is not. If a B-Class variant does arrive we probably won't see it until at least 2012. 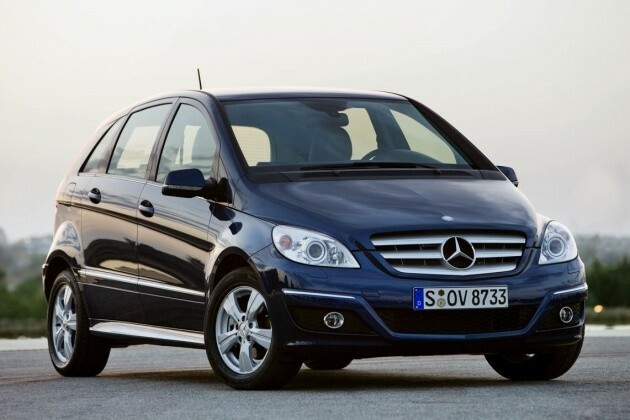 Mercedes-Benz polling customers on bringing B-Class to the States originally appeared on Autoblog on Tue, 11 May 2010 09:00:00 EST. Please see our terms for use of feeds. Some might say it is a matter of family honor, others that he is just a man trying to emerge from the giant shadow of his father. If you were to ask Robbie Knievel why he plans to attempt the great Snake River Canyon jump that almost killed his father, legendary daredevil Evel Knievel, he may say that it is just his way to pay his respects to his late, great poppa. And hey, maybe the hopes of a repeat performance in the generating of millions of dollars in publicity monies has some draw to a 40-something, out-of-the-spotlight stuntman... who are we to say? Whatever motivation tipped the scales of pursuing the concept to reality, word on the streets is that Knievel Jr is going for the big one! A spokesman for the "kaptain" said that the lesser Knievel will be headed to Idaho for a meeting with the who's who of Twin Falls, in hopes of garnering official support for the jump. 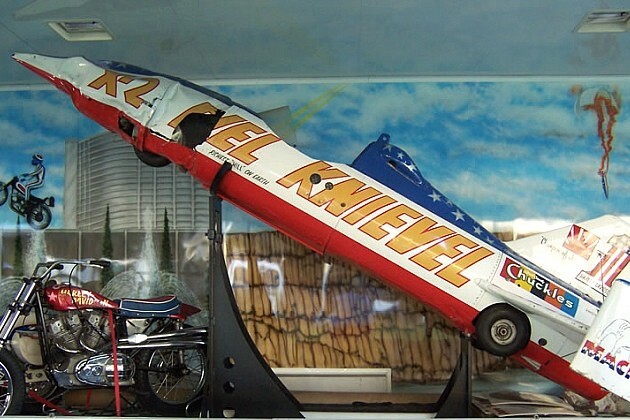 This should be the easy part of the process, as local government and business alike have been looking for ways to translate the Knievel-connection into visitors - and of course the subsequent cha-ching that often comes with them - for years now. Robbie plans to complete the first successful jump of the Snake River Canyon over the Fourth of July weekend in 2011, 37 short years after the parachute in his father's Skycycle deployed early, sending him plummeting into the canyon while millions of television viewers looked on. Let's hope that in this case the apple Skycycle falls far from the old tree. Twin Falls spokeswoman Julie Pence pleaded the fifth when asked about the planned jump, saying, "Officials are waiting to hear Knievel's proposal before commenting." Stay tuned for updates as we get them. Hmm... wonder if Robbie will wear the trademark Stars and Stripes onesie? Just Like Daddy: Robbie Knievel said to be planning Snake River Canyon jump originally appeared on Autoblog on Tue, 11 May 2010 08:31:00 EST. Please see our terms for use of feeds. As one of the most historic racing tracks in Italy, if not the world, Monza is inextricably intertwined with Alfa Romeo. Now those ties have been reinforced with the introduction at the circuit of the Alfa Romeo Giulietta as the safety car for the Superbike World Championship, which held its fifth round at Monza this past weekend. The Giulietta takes over pacing duties for SBK (as the series is known in shorthand) from the MiTo, which itself had assumed the mantle from the 159. The Quadrifoglio Verde version, with its 235-horsepower, 1.7-liter turbo four, will continue its role for the eight rounds remaining in the series this season. If your Italian is up to snuff, you can read more about it in the native-tongue press release after the jump. And if not, well, we've gone ahead and translated it (thanks, Google!) for you, too. 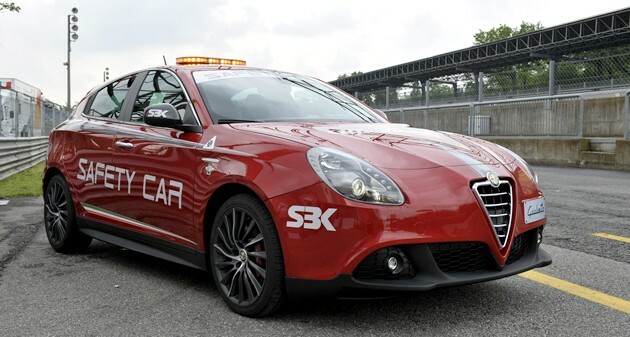 Alfa Giulietta sets the pace at Monza as Superbike safety car originally appeared on Autoblog on Tue, 11 May 2010 07:58:00 EST. Please see our terms for use of feeds. Is there life left in the company? Maybe. AutoblogGreen for 05.11.10 originally appeared on Autoblog on Tue, 11 May 2010 05:55:00 EST. Please see our terms for use of feeds. Japan is back in the supercar race in a major way following the introduction last year of the Nissan GT-R and the addition of the Lexus LFA for the 2011 model year. The question now is this: If the $85,000 GT-R is Godzilla, then what in the world (Or perhaps it's otherworldly? Read our review and decide for yourself.) is the nearly $400,000 (or more) Lexus? Clearly, with a price gap that large, the two automakers don't necessarily count the opposing product as direct competition for its own... but that doesn't mean we aren't keenly interested in seeing how the two Japanese performance behemoths stack up when the light turns green. Got your interest piqued? Fortunately for us, Motor Trend managed to procure a brand-new Lexus LFA for testing just long enough to line it up against the magazine's own long-term Nissan GT-R for an impromptu drag race. What happened? Well, the Lexus unleashed all 552 of its horsepower (at 8,700 RPM) and 354 pound-feet of torque (at 6,800 RPM) to its rear wheels and the Nissan used its all-wheel drive system to its advantage. And? Click past the break to find out how the rest of the story unfolds. Oh, and as cool as this grudge match may be, we still want to see what happens between the two warriors after a few laps on a proper race track. Thanks to all who sent this in! 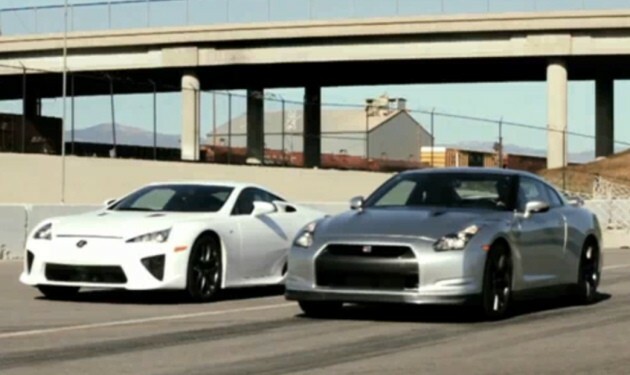 Video: Motor Trend pits Lexus LFA against Nissan GT-R in epic drag race originally appeared on Autoblog on Mon, 10 May 2010 19:58:00 EST. Please see our terms for use of feeds. The engineers in Stuttgart are hard at work prepping the next-generation SLK roadster, which should launch next year as a 2012 model. The smallest offering from Mercedes-Benz doesn't look all that far from being show-worthy either, which leads us to believe that the SLK could possibly make an appearance at the Paris Motor Show later this year. Details on the new SLK are slim, but rumor has it that an all-new twin-turbocharged V6 is in the works for the AMG-badged roadster, producing somewhere in the area of 476 horsepower. That's pretty insane, especially considering that the current (and already potent) SLK55 AMG makes due with just 355 horses. Obviously, the refreshed exterior design takes a lot of cues from the Big Daddy SLS AMG supercar, but new interior spy shots show that the updated cockpit will also be more akin to the Gullwing, as well. Note that the center stack features the Command head-unit integrated into the flat dash, with the radio and HVAC controls placed on a separate console below. We like what we see, especially since the current SLK interior is rather drab - not nearly as nice as what you'll find in the new BMW Z4. Scroll through the gallery below to see new spy shots of the next-generation SLK from all angles. 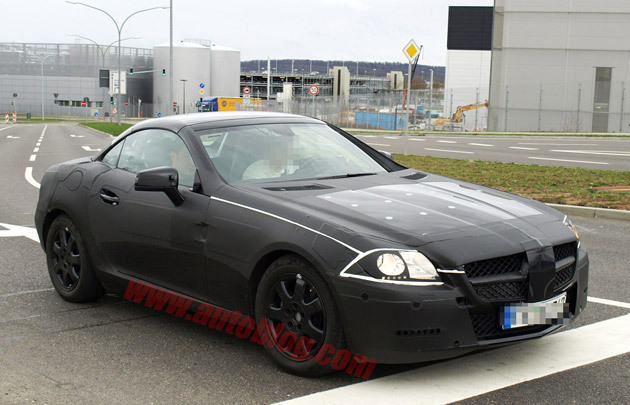 Spy Shots: 2012 Mercedes-Benz SLK caught training for Z4 fight originally appeared on Autoblog on Mon, 10 May 2010 19:25:00 EST. Please see our terms for use of feeds. Does the new Saleen have the resources and personnel to create an all-new product worthy of the brand? Saleen gave us the opportunity to drive one of its first production S281 Mustangs based on the the car's new-for-2010 body style, and we think we have the answer. 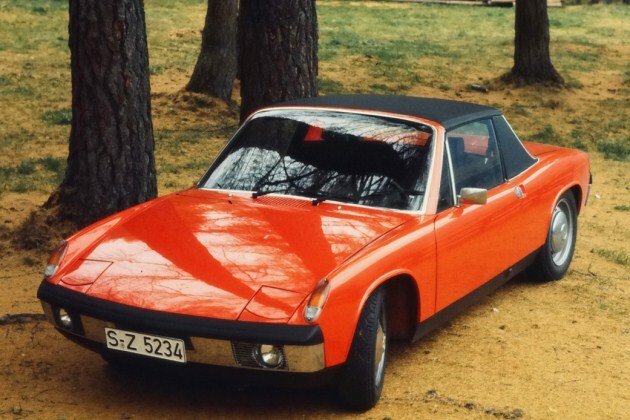 For those Porsche fans who were unable to acquire a 911 Sport Classic, of which only 250 were built, Stuttgart is now offering some of the bits that make up the Sport Classic car on an à la carte basis. As if the LFA wasn't going to be rare enough with a production run limited to 500 units, Lexus has announced a special edition Nürburgring Packag. Lexus will only offer 50 copies of the LFA Nürburgring Package to commemorate the car's participation in the 24 Hours of Nürburgring. Officially Official: Volkswagen Polo GTI, 177 hp, 40 mpg and plaid seats! Daily U-Turn: What you missed on 5.10.10 originally appeared on Autoblog on Mon, 10 May 2010 19:20:00 EST. Please see our terms for use of feeds. Copyright © 2010 Automobile.asia. Powered by WordPress and A Dream to Host theme by Art of Blog.